Recently I launched Fence Digital, the electronic imprint of Fence Books. Working with Rebecca Wolff, we are planning to release as many books as possible as often as possible. We are in the process of looking for new books suited to a digital environment, so find us over at Fence Digital. If you missed my editorial note that went out a few days ago, here it is. The idea that we coevolve through intimate interactions with our virtual media is both joyous and terrifying. Here at Fence Books, we choose to bedevil this evolution further by launching Fence Digital, a new electronic publishing imprint that reinserts materiality into the digital. To that end, our projects reevaluate the boundary between the virtual nature of digital information and the viscerality of text. When designing books, we think of the project in print, but we also consider how digital extra-textual qualities (video, image, animation, hyperlinks, etc.) might contribute to its textualization. In short, we design with attention to how a reader’s swipe interacts with a digital book as something that happens rather than something that exists. 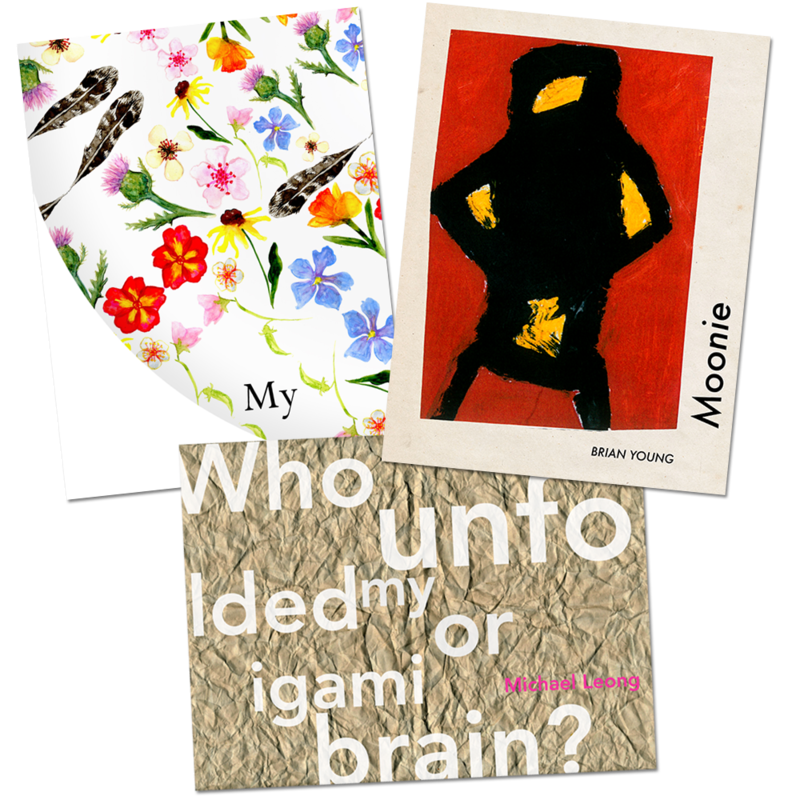 So, with the first three books from Fence Digital, we encourage you to coevolve with us: swipe across the rubber typed pages of Michael Leong’s Who Unfolded My Origami Brain?, the handwritten postcards sent on Brian Young’s road trip in Moonie, and the floating feather through Matthew Klane’s My. Download all these books and more at Fence Digital or on iBooks. In the spirit of precarious online collaboration, of me-s that are not me, of becoming me-s and other me-s, of the attempt to subdue the authorial tyrant (authorship is arbitrary power), I offer a couple examples of collaborative folly in which I have taken part. Here I use the following (fifth) sense of folly “A popular name for any costly structure considered to have shown folly in the builder” (OED online). The cost here is time, paid as risk (or wager that others will pay in attention). Here, the financial metaphor is contested. One folly is a time-costly provisional structure that existed, precariously and holographically, for one month in 2015. Another folly is a conceptual (and precarious digital) architecture and its accompanying theoretical interface. One is a month-long time-warped improvised online high-school drama. Another is an ostensibly networked interactive open-field digital concrete poem that could become a time-and-space-fluid archive of writing. All-Time High was a Netprov (internet improv) that ran in July 2015. It had a basic narrative structure worked out in advance, and a team of showrunners and featured players to keep it rolling, but it was built for drop-in public engagement. It was designed to be a collective online hallucination that would vanish after 28 days of infectious fever dream: What if everyone was back in high school, including you? The Archiverse is a conceptual compositional space, and Letters From the Archiverse is a poem I have been writing in AutoCAD drafting software for the past 9 years, in a version of that conceptual space. For the past 5 years or so, I have been theorizing The Archiverse with digital media scholar Andrew Klobucar. We are currently developing a networked tablet app version of The Archiverse, which will allow an unlimited number of reader/writers to collaborate in real time, but also explore and manipulate an archive of open-field composition at any moment of its composition. The ambition of the project is to reimagine the way language is collaboratively positioned (and manipulated) in time-space. It is also an experiment in decentralizing and distributing—or even atomizing—authorial agency. So my primary concern is dispersed authorship, collective texts and their resulting collections as digital archives. But I’d like to raise a related line of inquiry, in the context of this panel. Jeff T. Johnson’s writing has recently appeared or is forthcoming in PEN America, Fanzine, Jacket2, Tarpaulin Sky, and elsewhere. With Claire Donato, he collaborated on Special America, a multi-mediated performance intervention about American exceptionalism that stopped being funny when America stopped pretending not to be both self-absorbed and self-destructive. A Netprov feature player, he is co-creator of All-Time High. His open-field concrete digital poem THE ARCHIVERSE is documented at archiverse.net, and is anthologized in Electronic Literature Collection Volume 3. He wrote Trouble Songs: A Musicological Poetics (punctum books, 2017). A chapbook, trunc & frag, is at Our Teeth. He is currently a Visiting Instructor at Pratt Institute.